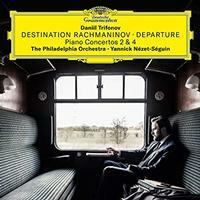 Pianist Daniil Trifonov releases Destination Rachmaninov — Departure, the first of two albums comprising Trifonov's cycle of the great Russian composer's piano concertos. The album features Concertos Nos. 2 & 4, recorded with Yannick Nézet-Séguin and the Philadelphia Orchestra (the same orchestra with which Rachmaninov recorded this set of concerti over 80 years ago), along with Rachmaninov's solo piano transcriptions of three movements from Bach's Violin Partita in E Major. Out now on vinyl.